Part high tech and part high fashion, Anouck Wipprecht's fantastical designs seek to interact with the world around them. 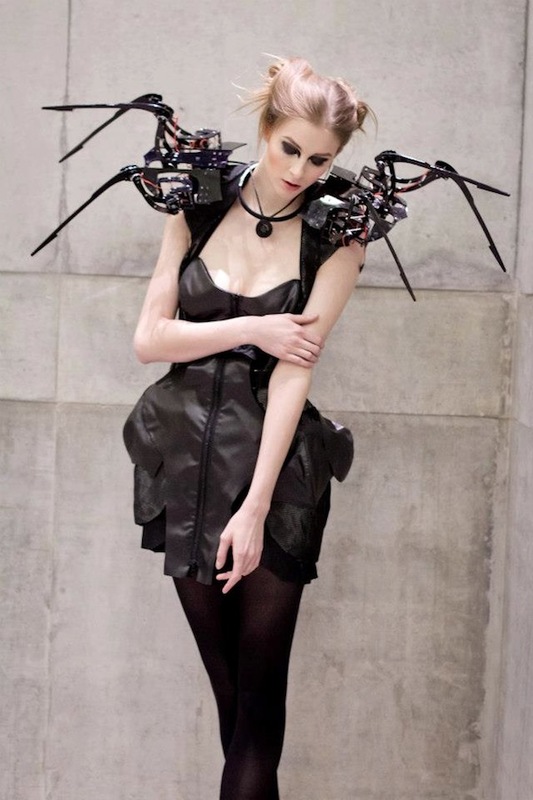 The latest project from this Vienna-based Dutch designer, the Spider Dress, is a collaboration with engineer Daniel Schatzmayr. With nuts, bolts and wires on full display, the epaulettes of the dress function as eerie animatronic spider arms. Crawling towards passersby and protecting the wearer from anyone who approaches too quickly or closely, the dress deals with themes of personal space. Be sure to visit Wipprecht's website to view more of her designs. She has created some truly unbelievable tech couture, including Fergie's memorable costume for the Superbowl XLV halftime show. If I have nightmares about spiders tonight, I'll know why. Creeptastic.